When is it suitable to safeguard danger zones with electrosensitive protective equipment? Use ESPE if you do not wish to prevent access to or encroachment of the danger zone but instead wish to safely stop the hazardous movement. The protected field is in this case safeguarded by optical sensors. Find out more about the wide range of possible applications! 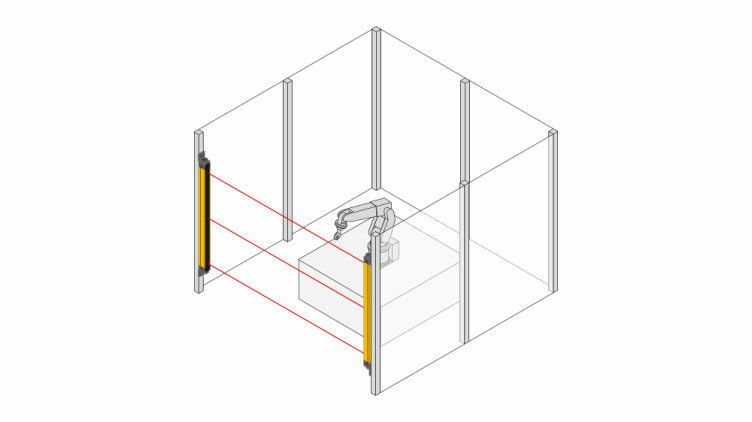 You wish to safeguard access to your robot cell without using protective fences? 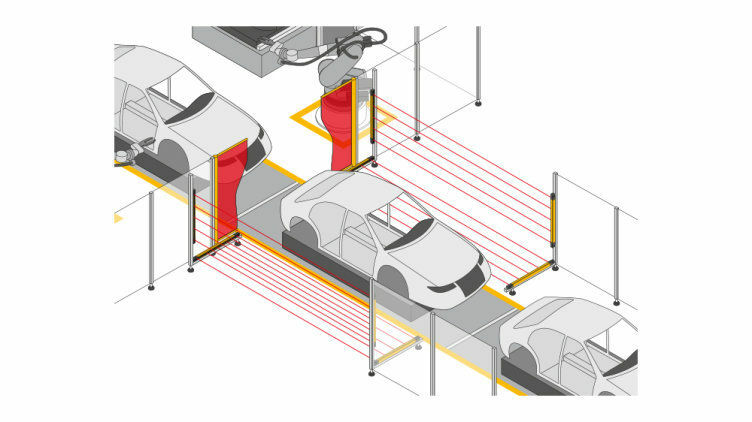 Safety light curtains are particularly well suited when barrier-free access is required. They monitor entry into the danger zone and safely switch off the robot as soon as they detect access by a person. An acknowledgement via the controller must be provided to restart the robot. 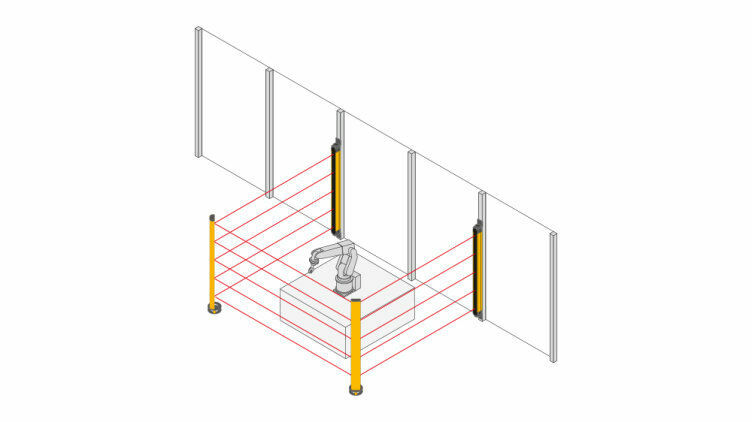 Instead of safety fences, robots can also be safeguarded with a simple combination of a pair of light curtains and two mirror columns. The mirror columns deflect the light beams of the light curtains so that one pair of light curtains is sufficient for monitoring all three accessible sides. 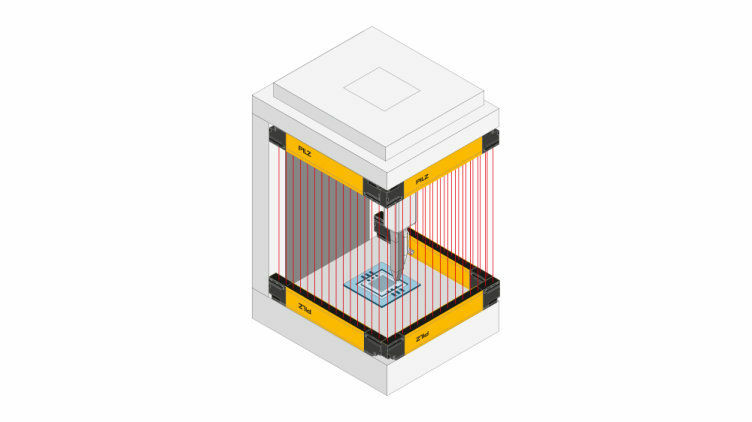 As a result they do not only safely monitor access to the danger zone, but also save space, costs and installation time! Robust light curtains with a rapid reaction time and a high performance level are in demand to safeguard presses. Rely on light curtains with finger protection to protect your employees against injury at the press! The press is safely stopped as soon as the light curtains detect a finger in their protected field. There are regular tool changes on long press lines. The tools are then transported on rails to get them into or out of the press, for example. The entrance and exit area must be safeguarded in this case. Save space, costs and installation time! Simply combine a pair of light curtains with two mirror columns. The mirror columns deflect the infrared beams of the light curtains. This only requires one pair of light curtains to safeguard all three sides to be monitored! Light curtains may interfere with each other when several work stations are in close proximity. You wish to avoid this interference? Then use light curtains with integrated coding! Coded light curtains do not interfere with each other even in close proximity. This is particularly true if the transmitter of the first pair of light curtains emits beams in the direction of the receiver of the second pair of light curtains. In this case, you can configure the light curtain pairs with different beam codes, for example Code A and Code B. 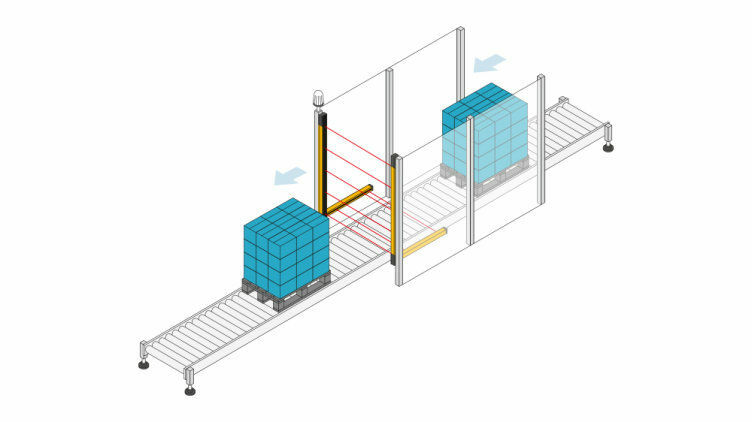 Light curtains with muting ensure problem-free operation when material is supplied or removed by a conveyor belt. This is particularly important for transporting packages in logistics centres or warehouse areas. With L-muting, transport of material is only possible in one direction (forwards). 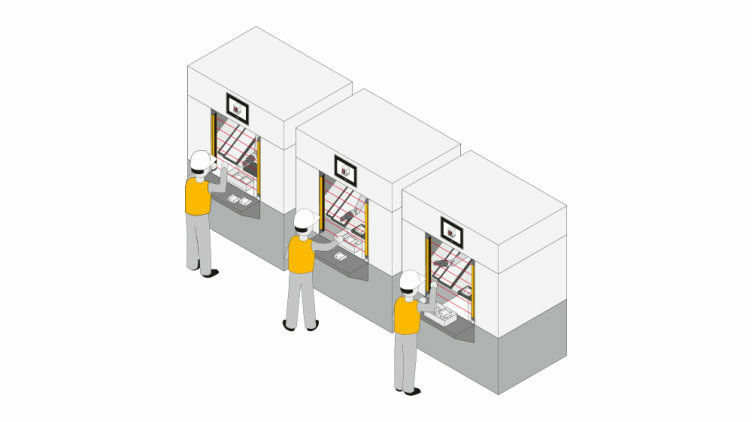 Material can be transported in both directions (forwards and backwards) using T-muting. The package is recognised by the muting sensors and may pass through the protected field. The muting lamp lights up during this time. 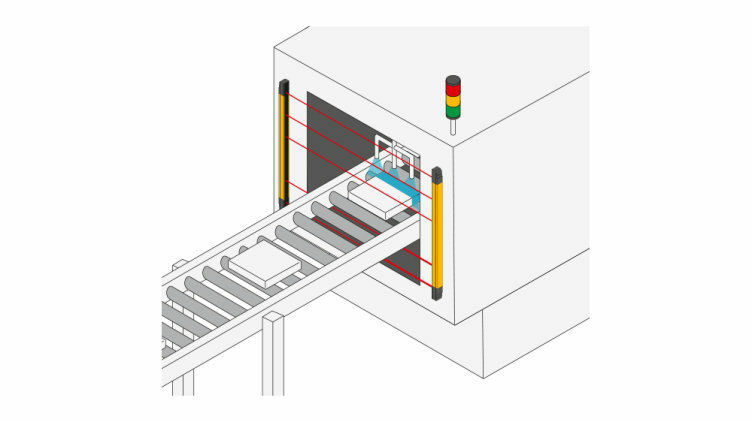 The speed of the conveyor belt is also monitored and the data forwarded to the controller. How is it possible to hide objects that protrude into the protected field of the light curtains? Use light curtains with fixed or floating blanking! 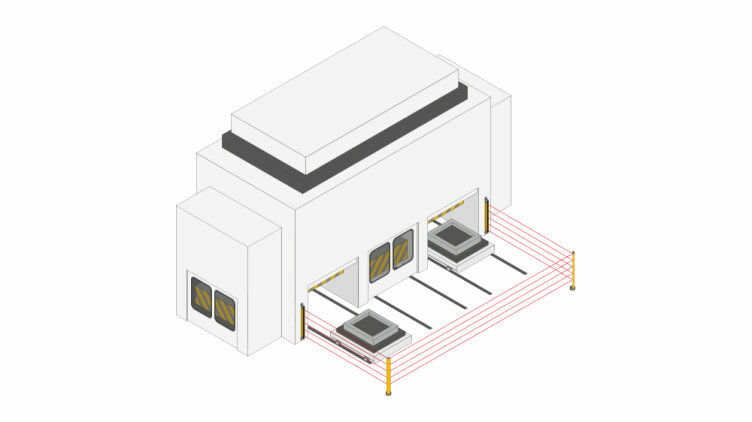 Fixed blanking is required when objects permanently pass through the protected field and therefore interrupt the beams of the light curtain. Floating blanking is used when objects permanently penetrate the protected field while also moving, e.g. through cables, and therefore interrupt certain beams of the light curtain. Both types of blanking stop the dangerous movement when the protected field is penetrated outside of the blanked area. You do not only require safe access to danger areas but also wish to safeguard the danger zone itself? Then you require a safety concept with rear access protection. Cascaded light curtains are ideal for this application. Use a cascading cable to connect two light curtain pairs. Several cascaded light curtains form a continuous protected field and behave like a single light curtain. Such applications do not allow acknowledgement in order to prevent a restart of the hazardous movement. 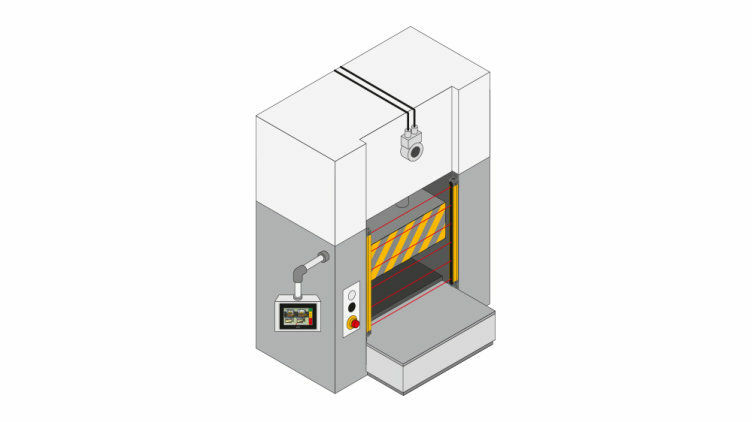 Narrow light curtains are particularly useful for safeguarding production processes such as engraving or milling. Because every centimetre counts in the design! Light curtains monitor encroachment in the danger zone without requiring a lot of space. They safely switch off the machine movement when the protected field is interrupted. You operate machinery with open areas into which you can reach, such as e.g. SMD assembly plants? You do not have much space for mounting safety sensors? Then use narrow light barriers to safeguard your machine! 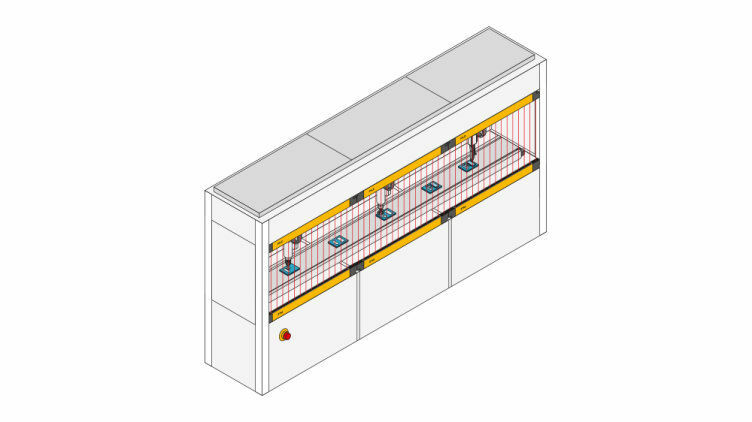 With long machines, you can cascade the light curtains longitudinally by using cascading cables and then benefit from a continuous protected field. As soon as the light curtains detect encroachment in the protected field, the plant is stopped safely.